My daughter just turned nine. I’ve been arming myself for when the day arrives that I really have to tackle growing up. *Sigh* Why can’t they stay little forever? Recently, I noticed that her skin was getting a bit oily (probably not entirely from budding hormones, we’ve been applying sunscreen liberally). I went on a search for a safe, natural, easy to use face wash for her. She is only nine after all and I can’t expect her to remember face washing if its time consuming, messy or gets anything into her eyes. I had a hard time finding anything I would want to put on her precious skin. I found several face wash recipes online, but most had to be mixed up prior to each use and were messy. So, I ventured to our local natural health store and browsed their selections, which we also limited. I did find one container with 50 wipes in it for everyday face cleansing. It was similar to those nasty, acne pads without all the nasty. The container was expensive so we moved on. In the end, I purchased a bottle of all natural witch hazel solution and organic cotton pads. Back at home, I place a weeks worth of cotton pads in a small, lidded container and poured the witch hazel over them. Now, she has an easy to use cleansing option and I don’t have to worry if the younger kids get into them and waste them, since I only prepare a small amount at a time. 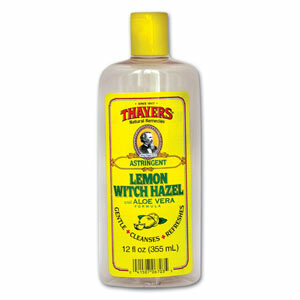 I’ve also started using witch hazel on my face and chest again. It leaves a refreshing feel that I am enjoying. Little Miss K’s skin is looking less like an oil slick. It’s a win-win, I don’t even have to fight with her over washing her face (regular water washing occurs in the shower, so we are getting that in as well). Baking soda is another great and gentle option, especially as they get older. One that I’ve been trying lately (warning this option IS messy) is raw honey. Regular honey works as well, but the raw honey seems to control pimples better. I assume because it fights the bacteria that causes pimples, but I really don’t know for sure. Anyway, it works REALLY well. Does not leave my skin dried out at all (and I have extremely sensitive skin – have searched for years to find something that cleans well, but doesn’t irritate). I can actually wash my face twice a day (once in the morning, once before bed), something I’ve never been able to do with other cleansers because of the irritation factor. All I do is just wet my face, then “lather” on the honey like a regular face wash, and rinse well. So, while this does not help in situations where you want little mess (because unless you do it in the tub, it is messy), this can be a very good alternative for face washing while taking a bath or shower. Keep Kids Out of Meds…With Kitty Litter? Stranger Slaps Toddler to "Shut her up!"